Beautifully engraved certificate from Gander Mtn. is unissued. This historic document was printed by American Financial Printing Incorporated and has an ornate border around it with a vignette of company's logo. This item has printed signatures from Company's Chief Executive Officer and Secretary. Gander Mountain is a leading specialty retailer that serves the needs of outdoor lifestyle enthusiasts, with a particular focus on hunting, fishing and camping. 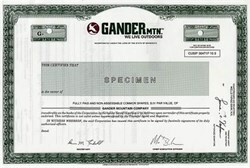 Gander Mountain stores offer broad and deep assortments of competitively priced outdoor equipment, accessories, apparel and footwear, combined with expert services and a unique store environment. In October 2004, the Company had 80 Gander Mountain outdoor lifestyle stores in 14 states - Colorado, Illinois, Indiana, Iowa, Kentucky, Michigan, Minnesota, New York, North Dakota, Ohio, Pennsylvania, Texas, Virginia and Wisconsin. The Gander Mountain brand has a 44-year heritage of strong appeal and relevance to consumers who participate in outdoor sports and recreational activities. The Gander Mountain brand was founded in Wilmot, Wisconsin, in 1960 as a catalog operation, which over time was augmented with retail stores.